The Seventies might have seen the introduction of the four-stroke Japanese superbikes but for a young lad looking to emulate his race day heroes it was a decade built on two-stroke smoke. 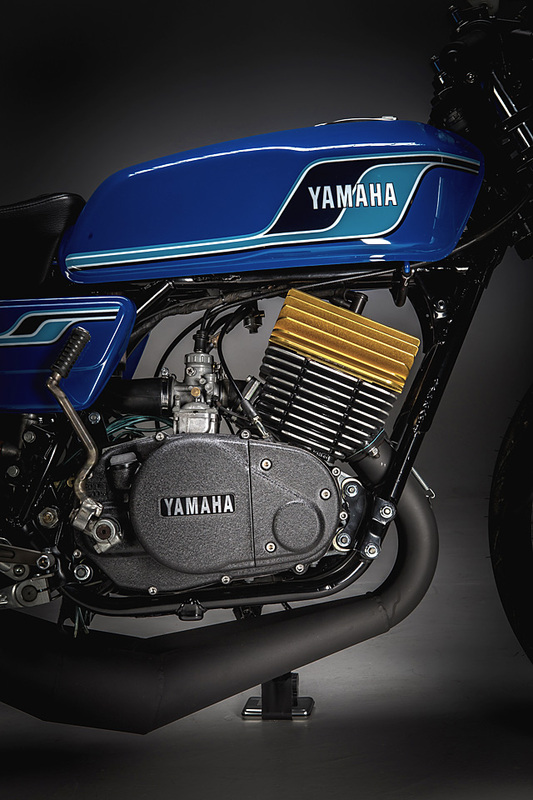 The Kawasaki’s had brutal power and beautiful lines, the Suzuki’s offered a level of durability not known to most smokers but it was Yamaha’s RD range that offered the most charisma. Forget your heated grips, traction control and smooth fuel injection when you jump aboard an RD400 and get it up to speed it’s a white knuckle, eyes on stalks experience and that’s before you’ve even pinned the throttle. 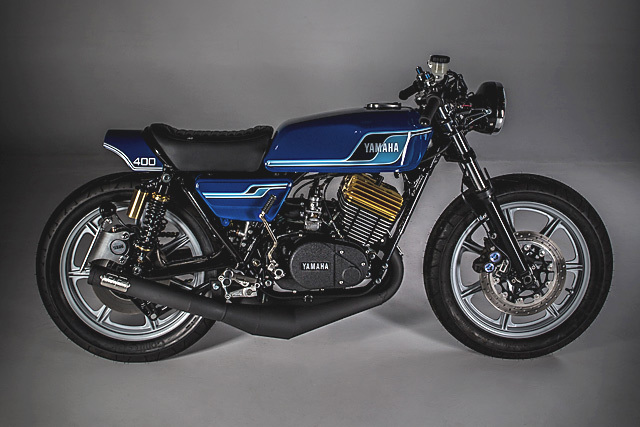 So when Sean Skinner of MotoRelic in Hamilton, Virginia, was approached by a friend to do a custom rebuild on his 1977 Yamaha RD400 he jumped at the opportunity. 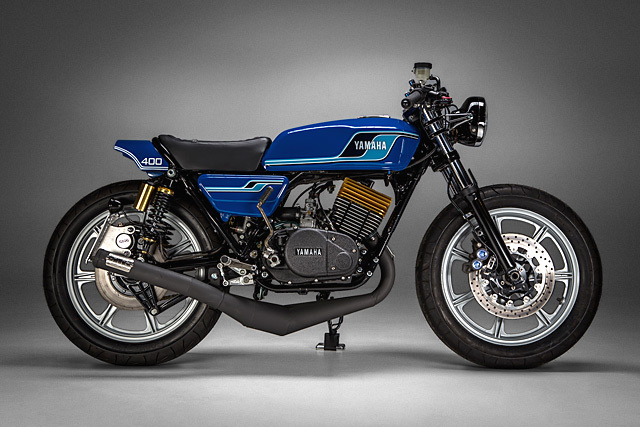 The end result is a screaming Yammy that looks better than any factory offering and delivers all of that two-stroke insanity in one hell of a beautiful package. When Sean took on the job he hadn’t actually seen the RD in question, “If I had seen it in person before agreeing, I might have had second thoughts.” But never one to back down from a challenge and knowing the potential that lurks under the skin of the RD400 it was straight up on the lift for a full diagnosis. 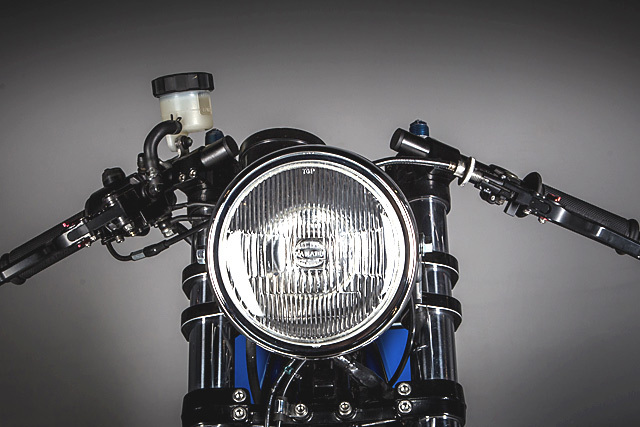 Take a look at any MotoRelic build and you can tell Sean is a planner; his bikes are comprehensively overhauled with no missed spots or last-minute half measures. So with the bike on the table and a clipboard in hand, a few minutes of poking and prodding let Sean know this patient was close to death, with a very long list of ailments. Not to worry as an order to two-stroke specialists in Nebraska, HVC cycles, had boxes of new goodies on the way and surgery could commence immediately. Then it was a matter of pulling the bike apart piece by piece to see where any structural damage might lay and boxing up the remaining good bits for later. 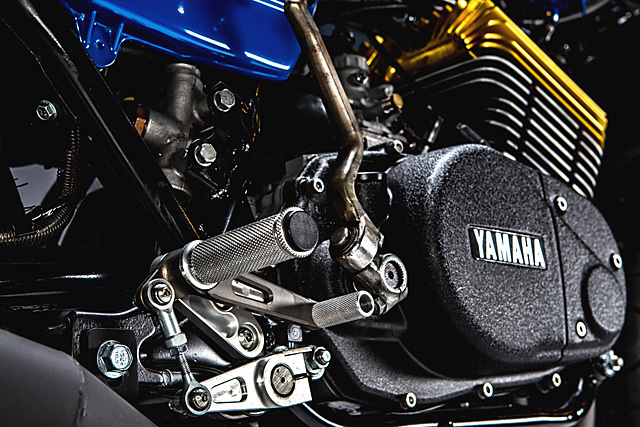 Like most two-stroke builds this one commences with the engine, rarely do you pull one apart that is in perfect running order and there would be no corners cut on the way to Yamaha nirvana. 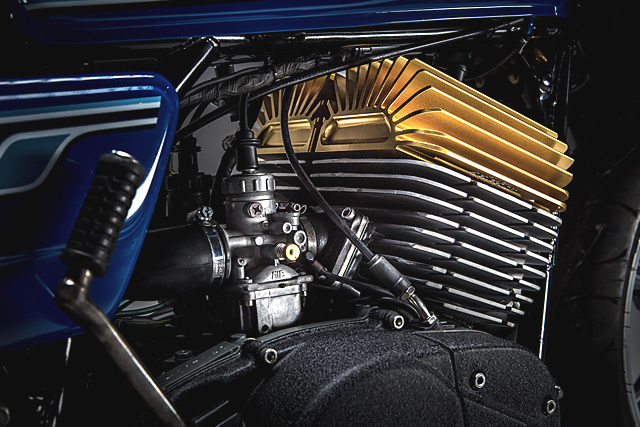 The 398cc, air-cooled, parallel twin has been given all the fruit and it starts with giving the cylinders a fresh hone. Then the short block was built up with all new bearings throughout before giving the rods a new set of pistons and rings to swing in anger. Those stunning DG replica heads from SCR didn’t come till later in the build after bike owner Rick was subjected to an adequate amount of peer pressure to get him to open his wallet for the big spend. But they are worth every cent, not only do they look incredible they deliver the performance to match having been developed to win at the Isle of Man and break land speed records. 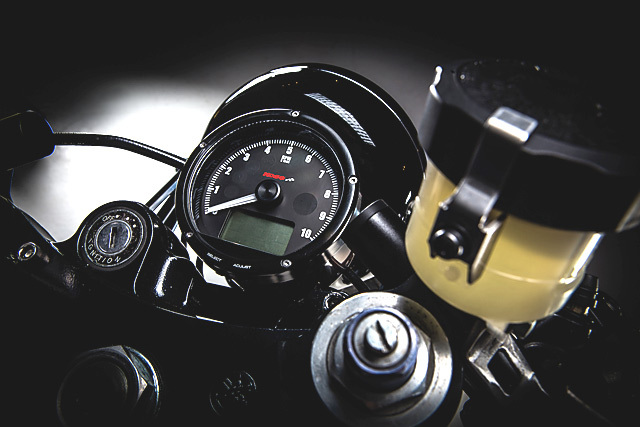 To work with the new R6 front end and control the rear the twin shock setup remains with a pair of adjustable remote reservoir items tasked with the job. 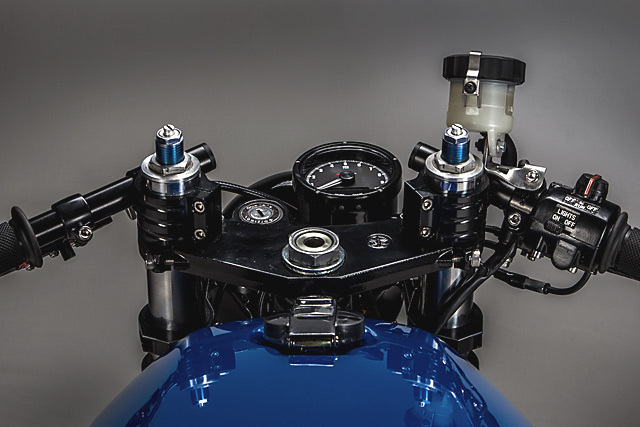 Speedmoto headlight brackets and a single Koso speedo clean up the front end remarkably well and with the new clip-ons only wearing the barest of necessities the all business theme of the build rules throughout. A powerful and lightweight Shorai battery sits in the stock location and to complete the build a set of HVCcycles brilliant rearsets do the business. Rolled out of the workshop door it’s hard to know whether Rick stood back to admire his new possession or jumped on and screamed off down the road but either way Sean’s got his mate covered with an incredible build. 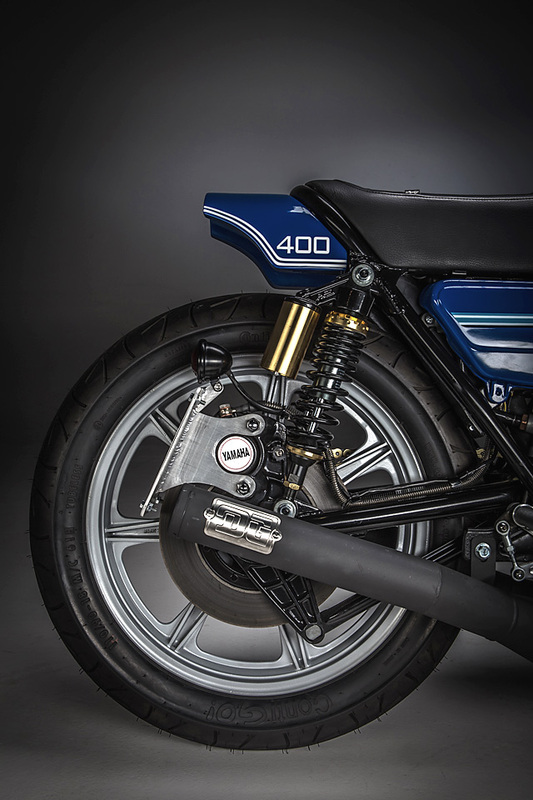 “That sound and smell brings back fun memories for anyone who has thrown a leg over a 2 stroke motorcycle as a kid” and those glorious years of the ’70s come flooding back.